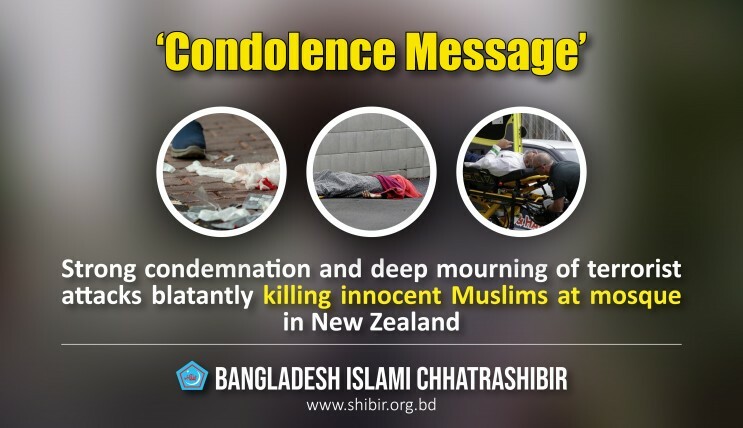 Bangladesh Islami Chhatra Shibir has strongly condemned the killing of 49 people, including two Bangladeshi nationals, in terrorist attacks on incoming worshippers during Friday prayers in two mosques, including Al-Nur Mosque, in Christchurch, New Zealand. In a joint condemnation and condolence message, Chhatra Shibir Central president, Mobarak Hossain and Secretary-General Sirajul Islam said that we are deeply shocked and saddened at the planned massacre after entering the mosque and indiscriminately shooting at the worshipers at Jumu'ah prayer. At least 49 people, including Bangladeshis, were killed in the terrorist attack. Many of the injured are in critical condition. The Bangladesh national cricket team visiting New Zealand on a tour were just saved from becoming victims themselves. The Muslim world and peace-loving people are shocked at this brutal incident. We do not possess the language of condemning this brutal barbarity. This attack is not an isolated incident, but is indicative of a prevalent form of Muslim hatred, racism and fascist behavior in a brutal manner. This incident has made the peace-loving people of the world angry and afraid. The leaders said that there has been sustained operation of anti-Islamic propaganda and terror attacks on Muslims in the past, and it continues to happen even now. It is important to end this situation. In this incident, we demand advanced treatment for the injured and the highest punishment for the terrorists involved in this incident. At the same time, we call on security arrangements for Muslims everywhere, including New Zealand. The world never wants to see such ruthless bloodshed under any circumstance. We pray to the Almighty for the maghfirah of the hearts of the deceased and their martyrdom and quick recovery for those who were wounded in the brutal attack. We extend our heartfelt sympathy to the bereaved family members of the deceased.